Purifan was invented by Paul Fiacco, a geophysicist working in the oil industry. The company first focused on smoke removal fans then other air purification for allergic, asthma and other patients. It saves much space in your room than other purifiers which sit on floor. The blades of PuriFan are enclosed to avoid any kind of accidents. The Purifan uses a five-stage air filter system or a double charcoal filter system to remove contaminants such as dust, smoke, pollen, mold or pet odors from the air. Air is drawn up into the Purifan, filtered and re-circulated at a rate of 2,000 cubic feet per minute. PuriFan makes less noise than even bladed fans. It can run continuously for 24 hours a day. 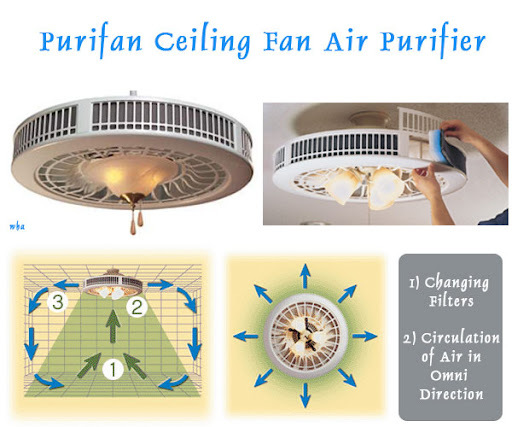 PuriFan is highly energy efficient because it uses only 60 watts and 0.5 amp on highest setting. While other electrostatic purifiers hog upto 1000 watts. Purifan comes in many eye pleasing designs and colors to best suit your interior. PuriFan also comes with a Lifetime warranty, just you need to replace the filters in 9-12 months depending upon your place. You can also wash the plates like ordinary fans time to time. The purifan may seem to be expensive but it's cheaper than it's competitors. Visit the PuriFan catalog, select your filters, model and color. If you are looking for any good gift for your parents, then Purifan is the coolsest gadget for the same. Cool fan :) Vector Graphics says that no fan is needed in Darjeeling and here in Kolkata Purifan Fan will not work in this heat :P.
This is a great solution for people live in cities, but seems to be little costlier. You can use it along with the AC!